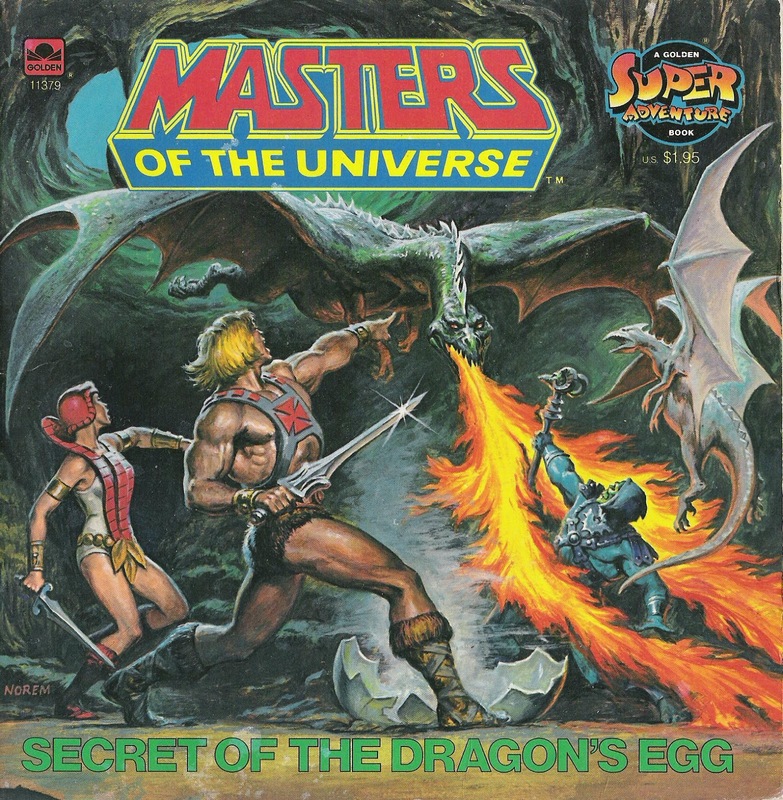 Secret of the Dragon’s Egg is a 1985 Masters of the Universe children’s book written by Jack C. Harris and illustrated by Luis Eduardo Barreto. Here, the Heroic Warriors and the Evil Warriors race to find and enlist a dragon to their respective causes. The story’s structure is notably similar to that of Meteor Monsters, also by Harris and Barreto: both factions exploring (and fighting in) a series of locations in search of the MacGuffin. In this one, at least, the plot is a bit more sensibly handled (not a lot, but a bit). There’s also a weird little meta-moment on page 18, where Teela incredulously repeats something the narrator has just said. 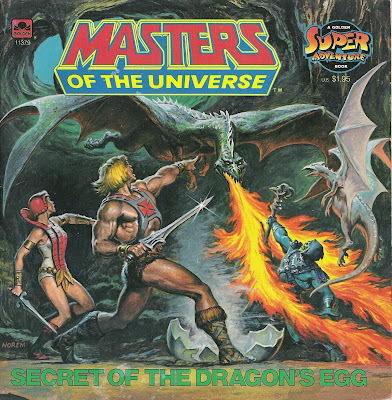 Interestingly, what we’re told about dragons here (apparently they’re an endangered species) differs greatly from the Filmation cartoon and the mini-comics, which are populated by Granamyr and a number of other dragons. There’s also a named character here we’ve never seen before or since: Goat Man, a sort of lame proto-Hellboy. He’s no Snout Spout, but we certainly didn’t miss out by not having him around. Barreto’s art is a definite plus, as he does a good job with figures, action, and backgrounds, and his attention to detail is strong (sometimes). However, he portrays the royal palace as being in the middle of an overgrown forest, in a seemingly remote location. And he again has a little trouble with He-Man’s harness as suspenders (Beast Man’s wearing boots here, too). Another art highlight is, as always, the great painted cover by Earl Norem. The coloring, however, is sloppy, as in the other books in this series, particularly as concerns Man-At-Arms, whose armor is drawn symmetrically but colored asymmetrically. In the end, Secret of the Dragon’s Egg isn’t anything special, but it does enough right to make it a fun read.